Our newest coin counter from Scan Coin that fills the gap between heavy-duty counters and small back-office machines. This high-speed (3,000 coins/min.) counter combines superior versatility with standard advanced features. 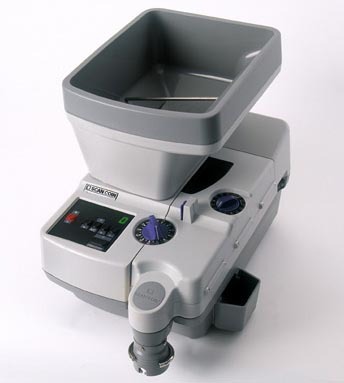 The SC360 has separate adjustments for coin or token diameter and thickness so you can count /sort coins from 0.59 - 1.50" Dia / 0.03 - 0.15" Thick. Has a built in RS-232 port for external control, remote display, or printer. Other features include pre-selectable bag stops, memory, automatic reverse function to remove jammed coins, and automatic stop and off sort function for smaller coins. Includes wrapping adapter.